Managing the order cycle from capture to post-sale customer service without the right tools is a juggling act. Afraid of dropping the ball? Allow a2b Fulfillment to act as your safety net with our innovative Order Management System solutions that tie the front and back ends together and put you in control of your campaign. Collect, track and manage all customer and order data from multiple sources, including Web, IVR and Phone. Facilitate the processing of those orders, from payment to disposition, including continuity and multi-pay programs. Provide a platform for customer service (a2b’s or your own), returns and post-sale promotion. Analyze sales performance by source and channel, media spend and ROI, continuity retention and more to help optimize your campaign strategy for better results. In addition to complete visibility, pair this information with our sophisticated campaign management tools and sit in the driver’s seat. Offers can be easily altered to quickly adjust to changing market conditions where you can add items or change prices at will. Dynamically direct customer service agents by tying-in to phone scripting. Leverage our technology to seamlessly manage your campaigns while increasing profitability. 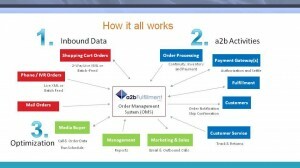 It’s all that easy – all you need is a2b, we’re more than just a fulfillment provider. Our feature-rich Order Management System is the solution you’ve been waiting for – contact a2b Fulfillment for a test drive by calling 1-866-843-3827! Or email us at sales@a2bf.com .